Abbey Glen was started by Epcon Communities and is now under development by Terranova Group. 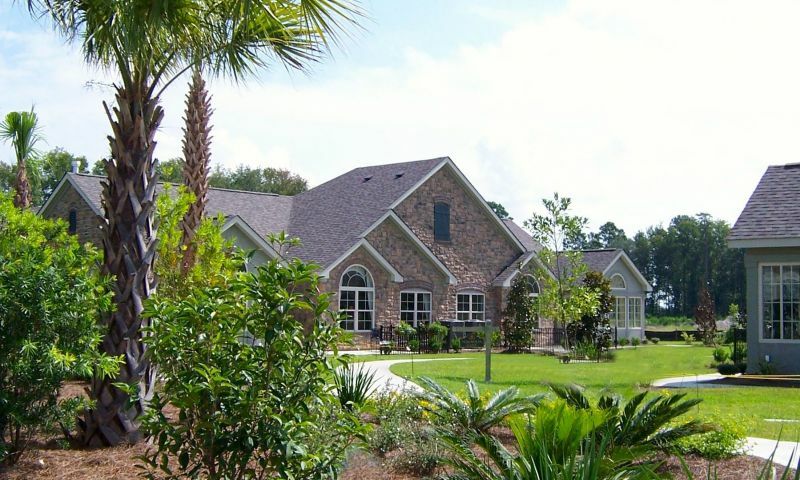 This charming, non age-restricted community is located in Hardeeville, SC. Abbey Glen consists of 112 attached and single-family homes and a quaint clubhouse with an outdoor pool. The community is an ideal retreat for buyers who want maintenance-free living near Hilton Head in South Carolina. Residents in Abbey Glen have access to the beautiful community clubhouse. The clubhouse features a fitness center where residents can stay active and fit by using the cardiovascular machines or weight-training equipment. There is also a multi-purpose room, billiards table, catering kitchen and screened lanai and fireplace, which provides an ideal setting for residents to socialize, mingle and relax with other neighbors. Homeowners can also enjoy the Coastal South Carolina climate by swimming in the outdoor pool or getting some sunshine and rest while lounging on the sundeck. Abbey Glen offers ranch-style attached homes ranging from 1,325 to over 2,600 square feet with unique European country exteriors with stone and brick accents, wood plank shutters, lap siding and stucco. These attached homes were built by Epcon Communities until the Terranova Group came in and took over construction. The attached homes come in three collections such as Cathedral Series, Courtyard Series, and Ranch Villas. These homes feature one to three bedrooms, two to three bathrooms, and attached two to two-and-a-half-car garages. Some models offer covered porches, private courtyards, and an optional second-floor bonus suite for extra space. These homes are available as new construction or resale. Abbey Glen has only one single-family model called the Magnolia available as new construction. This single-family home offers 2,280 square feet of living space and homebuyers have the option of adding a second-floor bonus room and optional bathroom. The Magnolia features two or three bedrooms, two-and-a-half or three-and-a-half bathrooms, and an attached two-car garage. Although there is no on-site activities director, residents organize various social clubs and events within the community. Also, homeowners have more time to relax because the homeowners association (HOA) takes care of exterior home maintenance. The HOA fee includes landscape maintenance, home exterior maintenance and community clubhouse maintenance. Abbey Glen is located on US 278 just 6 miles off exit 8 of I-95. It is across from the University of South Carolina Beaufort campus in the heart of the Lowcountry. Walmart Supercenter and Technical College of the Lowcountry are less than a mile away. Within a half hour of the community residents can access the beaches and resorts of world famous Hilton Head Island. The historic cities of Savannah, GA and Beaufort, SC are only 45 minutes away. Homeowners looking for a quiet neighborhood setting and maintenance-free homes can look no further than Abbey Glen in Hardeeville, SC. There are plenty of activities available in Abbey Glen. Here is a sample of some of the clubs, activities and classes offered here. The attached homes within the Cathedral Series by Epcon Communities offers 1,325 to 1,926 square feet of living space. These homes feature Cathedral ceilings, one to three bedrooms, one-and-a-half to two-and-a-half bathrooms, and a two-car garage. These attached homes are available as new and resale. The attached homes within the Courtyard Series by Epcon Communities features two bedrooms, two bathrooms, and a spacious two-and-a-half-car garage. These homes offer 1,400 to 1,816 square feet of living space. These homes are available as new and resale. These homes are built by Terranova Group and offer 1,920 to 2,600 square feet of living space. These homes have two to three bedrooms, two to three bathrooms, and an attached two-car garage. These homes are available as new and resale. These single-family homes offer 2,280 square feet of living space and has two or three bedrooms, two-and-a-half to three-and-a-half bathrooms, and an attached two-car garage. This home is available as new construction. Abbey Glen is perfect for me at this stage of life. I wanted a small home I could easily afford with NO upkeep required. It's nice having a small clubhouse here with a gym and a pool. The area itself has a ton to offer and I also go to Savannah and Hilton Head Island a lot. 55places.com is not affiliated with the developer(s) or homeowners association of Abbey Glen. The information you submit is distributed to a 55places.com Partner Agent, who is a licensed real estate agent. The information regarding Abbey Glen has not been verified or approved by the developer or homeowners association. Please verify all information prior to purchasing. 55places.com is not responsible for any errors regarding the information displayed on this website.